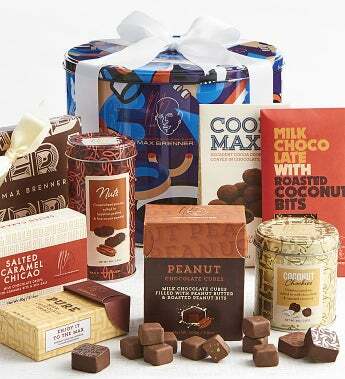 For the ultimate in chocolate gifting, this Grand Chocolate Art Collection gift set is filled with many of Max Brenner’s best-selling chocolate creations. It is certain to make a memorable impression on the recipient. Inside are a 9pc unique handcrafted Bonbons box, caramelized pecan Nuts, cocoa cookies rolled in rich almond cream & dark chocolate, Coconut Chockies, Peanut Chocolate Cubes, Salted Caramel Chicao with caramel bits and sea salt, Milk Chocolate Tablet and Milk Chocolate Thins.